Welcome to your sales weekly roundup for March 24-31. This week we’ve got three key points to maximize the power of consultative selling, why women make better salespeople (they do?!) and the top character traits for different sales environments. Enjoy! Avoid checklist-style questioning: Edinger has seen time and time again with inexperienced reps to senior partners at large consulting firms that relying only on questions never results in extracting the right information from prospects. Even if salespeople are tailoring their questions based on information about each buyer, going through a checklist isn’t enough. Instead, learn to create value through insight and perspective. Avoid negative conversational behaviors. In her article, “The Neurochemistry of Positive Conversations,” Judith Glaser shows how certain behaviours produce certain chemicals: positive ones are correlated with oxytocin, and negative ones with cortisol. Behaviours such as “being too aggressive, not listening, and going on about their offerings,” are negative, and “stimulating discussions with genuine curiosity, and painting a picture of mutual success,” are positive. Lessen the negative and focus on the positive to create a good conversational vibe and a collaborative dynamic with positive outcomes. Gong analyzed a ton of sales calls and found some interesting results. We’ll cut to the chase. Women violate the rules of sales. 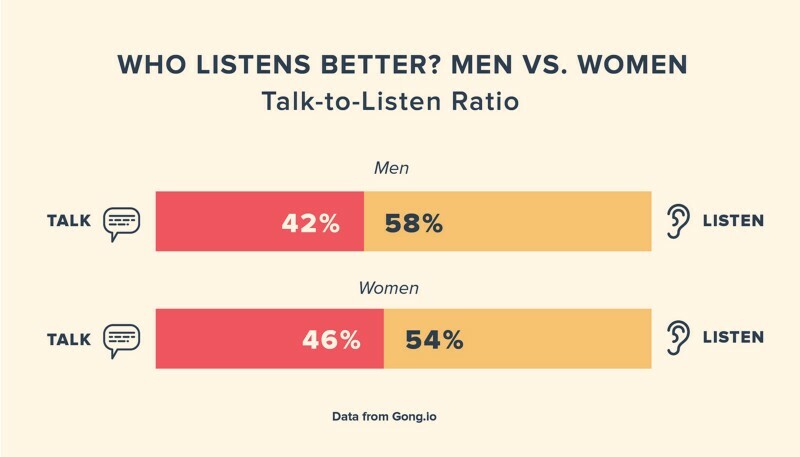 Men, on average had 42:58 talk-to-listen ratio, while women averaged 46:54, talking 9% more often than men. Men also interrupt their prospect an average of 4.2X per hour. Women? 6.3x per hour—about 50% more often. Yet, women are closing more deals. Men had a 49% likelihood of moving opportunities to the next stage, while women had 54%. Women on average also had an 11% higher closing rate than men. The woman also talked a lot too, but she made persuasive points or told a customer story rather than simply rambling. Sales consultant and author Lee Bartlett analyzes top performers in three greatly different sales environments. He’s personally met each of these people, and anecdotally outlines the characteristics that lead them to success. Deal characteristics: High-value, long and complex sales-cycle, enterprise-wide solutions. One thing he taught Lee: Your sensitivity is your greatest strength. Deal characteristics: Very high-value, high volume, short sales-cycle, C-Level pitches. One thing he taught Lee: Don’t do anything that doesn’t generate revenue. Always ask: What’s the ROI of your next action? Deal characteristics: High-value, no key product differentiators, short sales-cycle. One thing she taught Lee: The importance of a quick recovery after a loss. The faster you recover from a deal loss, the faster you are on the next.